These exercises involve gently manipulating the body’s joints starting from the head and working down to the feet. The movements could start by rotating the head, shoulders, flexing the elbows, wrists and fingers. This carries on by working your way down through the spine, hips, knees, ankles and toes. This part of Junbi Undo is to warm the large muscles in the students body to prevent possibly injuries from stretching and ballistic movements that is seen within the martial art. Therefore, these exercises are aerobic in nature, however, they are not done to tire out and fatigue the student at this stage. They should be carried out just to get the heart pumping and blood circulation to warm up the practitioner’s body for the lesson ahead. Typical exercises are running on the spot, bouncing, jumping jacks, burpee, jumping and lifting knees into the chest. A range of these are done so as not to be mundane during this period of warm ups. Chiishi – concrete weights on a wooden pole. Ishi Sashi – hand held weights, like padlocks, made of stone or metal. Makiage Kigu – weight hanging on a rope from a wooden handle. Nigiri Game – ceramic jars filled with stones or sand to impart different weights. 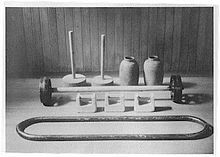 Tan – wooden bar with stone or metal weights at each end, looking like barbells. Jari Bako – bowl filled with sand or smooth stones. Tetsu Geta – metal or wooden clogs warn like sandals. Kongoken – metal oval bar that can be filled to vary the weight. Tou – a bundle of bamboo tied together either at both ends or in the middle. Makiwara – post or board with one end covered with hemp rope while the over is secured to the ground. It is panned that a in depth article will be written about Hojo Undo and will be made available to our members via the Members’ Pages – so keep a watchful eye out!